Avery joined the AGR family from a farm in Kansas. Her last race was in July 2014. She raced 68 races in her career. She is a darling little girl and is very intelligent and can open some types of gates. She is also very sweet and people centered. Avery had a bout of worms when she first came to us, but she is parasite free now! She has had a torn ligament on her right rear leg, but she has finished her anti-inflammatory meds and is now asymptomatic. 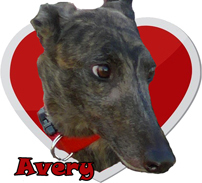 Avery is scheduled for an orthopedic evaluation in March. Once she is cleared medically, she will be adopted by her foster family.